In this easy magic trick for kids, a rubber band mysteriously jumps from your pinkie and ring fingers to the first and middle fingers of the same hand and then back again. One medium-size, colored rubber band. If you like, you can substitute a hairband for the rubber band. Once you master this trick, you can learn an impressive, advanced variation with two rubber bands. Hold your hand naturally and wrap the rubber band around your pinkie and ring fingers. Let the rubber band rest at the base of your fingers. The back of your hand should be facing your audience. With your other hand, stretch the rubber band and insert the tips of your pinky, ring, middle, and first fingers into it. Rest your fingers in the rubber band, against the palm of your hand. Notice how all of the fingers are resting inside of the rubber band and how the band is held against the fingertips. At this point, you should be able to simply open (straighten) all of your fingers to make the rubber band appear to "jump" to your index and middle fingers. If the rubber band doesn't jump, please review the instructions. Note that by reversing the direction, you can make the rubber band jump back to the original fingers. An advanced variation of this trick requires two rubber bands; in this trick, one rubber band appears to switch places between your fingers, and the second appears to block it. As with the easy trick, you can substitute hairbands for rubber bands. One rubber band is placed just as you placed the rubber band in the easy trick, while a second rubber band encases all four fingertips. 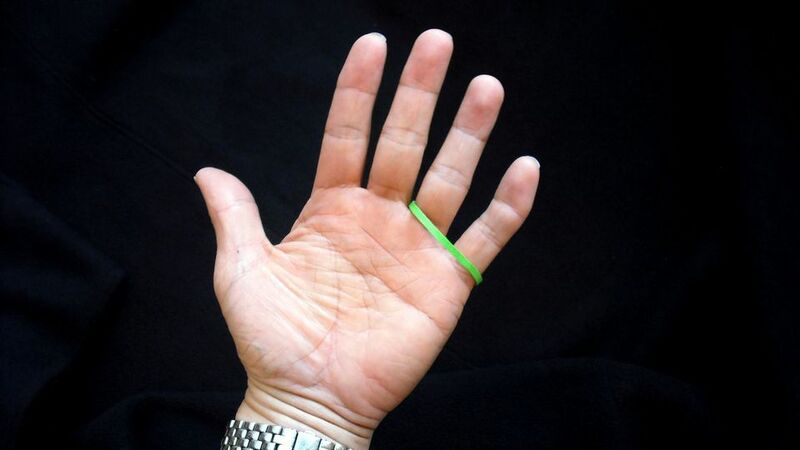 Even though you’ve wrapped the rubber band around the tips of your fingers, one rubber band quickly and mysteriously jumps from your pinkie and ring fingers to the first and middle fingers of the same hand. Try this advanced variation of the rubber band trick, too, and see if you can master it.